Ribbon windows are a band of windows (placed side by side) and separated only by either a simple frame, mullion or an inch strip of rubberized caulking. While ribbon windows are most commonly associated with commercial buildings, they can be used very effectively on residential homes as well. They can be very stylish, allow for great lighting, while maintaining privacy and typically are in the mid price range. Ribbon windows are a level ribbon or band of windows that are common on large commercial and industrial buildings. Homeowners can utilize these types of windows to great effect, providing a modern and sleek focal point that feels open and spacious. The can be placed low like a normal window or higher up on a wall to still allow for light and maintain privacy. Ribbon windows are nearly always fixed or non movable and do not maximize the window glass area. This means they are usually energy efficient windows and allow in tons of light. Done right, ribbon windows can provide a great combination of style and functionality. Coming up with a price range is tricky business in that there are so many different set ups and combinations. In general, the windows themselves will be priced out like any fixed frame window. The installation will be more expensive than inserts – most of the time the window is placed in the opening and the mullions will be mulled together on site. Expect an average window installation pricing to run $250 per window. Because the area of the window pane is maximized by not using a thick frame, they effectively allow lots of light into a room. Using a strip of strong rubberized caulking exposes the entire window pane to bring in light to full effect. This can be a fantastic option for rooms that commonly are dark and without adequate natural light. Ribbon windows placed high up on a wall can still allow in lots of light, while still maintaining a homeowner’s privacy. Of course, this set up does not provide homeowners with a view from the series of windows. One way around this is to place them at the same level as standard picture windows but use a darker tint or reflective material on the outside to prevented anyone on the outside from looking into the home (as is common on commercial buildings). The other common option is to simply use a window treatment across the glass. Non movable or fixed frames are more energy efficient than movable options such as awning or casements. This translates to better energy savings and lower heating and cooling bills which may be small each month, but can add up to real savings over 10 years. 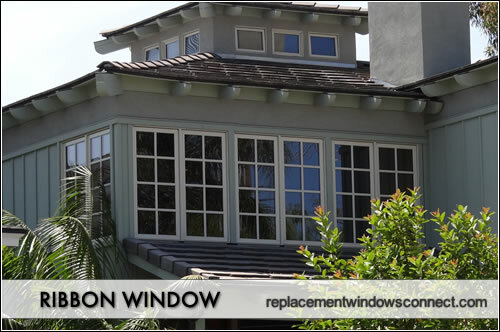 Ribbon windows require custom installation, which will cost more than simple inserts. The installation needs to be done right so hiring competent window contractors is a must on these projects and they will probably be at the higher end of cost scale. It is common that the windows themselves will be custom made and ordered, which again carries a higher price tag.